At the Evoma coworking space in Bangalore, we go by our motto of “Why work when you can cowork.” But if you’re wondering why cowork, the answer is laid out clearly in the coworking trends and statistics infographic below. There were just three coworking spaces back in 2005. The count had grown to 7,800 two years ago, and now stands at 13,800. The number of coworking spaces worldwide keeps doubling every year, and is predicted to reach 37,000 by 2018. 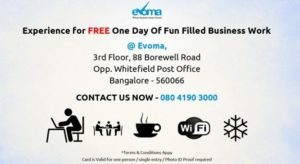 Interested in Coworking in Bangalore? Come to Evoma. Very helpful and informative post that gives the statistic on growing trend of co-working spaces. Hello Sumit, and I’m glad you found this post useful. Coworking has indeed grown fast, and let’s hope it grows a lot faster in this year.